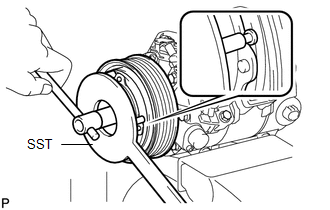 (a) Place the compressor and magnetic clutch in a vise. 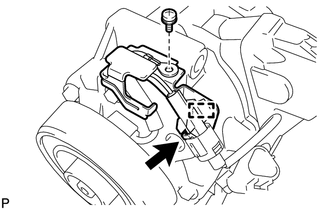 (b) Using SST, hold the magnetic clutch hub. 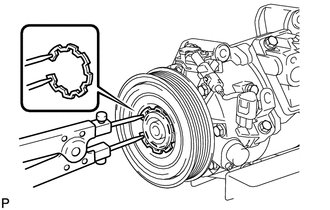 (c) Remove the bolt, magnetic clutch hub, and magnetic clutch washers. There is no set number of magnetic clutch washers because they are used for adjustment. 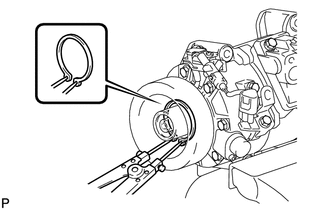 (d) Using a snap ring expander, remove the snap ring and then remove the magnetic clutch rotor. Take care not to damage the seal cover of the bearing when removing the snap ring. (g) Remove the screw and the bracket. (h) Using a snap ring expander, remove the snap ring and magnetic clutch stator.